Walsh is a thriving University with 14,000+ alumni and counting. 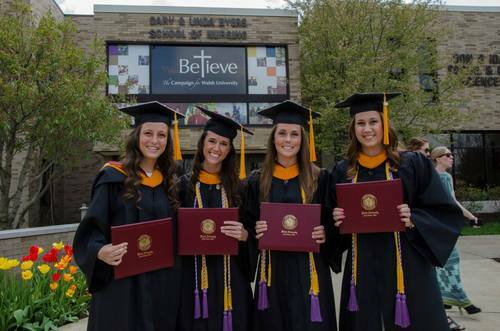 After our graduates step off of Walsh's campus they may travel far and wide but they are "4-Ever Walsh." Regardless of where they live, we urge our alumni to keep in contact with us so we may continue to grow together as a community. One way we maintain that connection is through our alumni chapters. All Walsh alumni are members of the Walsh University Alumni Association, a non-dues-paying organization that consists of geographically organized chapters. Some encompass a metro reason, such as Akron, which pulls from the city and neighboring counties. Others are organized within a certain mileage radius around a major city. Chapters range in size from 25 to more than 4,000 individuals. Within a geographic area, all alumni are considered members of the local chapter and are welcome at all chapter events. Alumni and parent volunteers have a huge impact on Walsh University's recruiting success. Your stories and knowledge can really make a difference to prospective students who are considering different colleges. With your input, Walsh University may continue to enroll outstanding students who will carry on Walsh traditions and its legacy. You can help by referring a prospective student. Please be sure to update your information with us so that you are receiving invitations to your local chapter events. Learn how to form an alumni chapter.